With the snowstorm, the kids didn't have school, so we got off to a slow start. I'm making Turducken soup (more on that in another blog post) but at some point everyone got hungry. We had some leftover bacon so I decided to try a frittata. Beat the eggs and milk, add the spices. 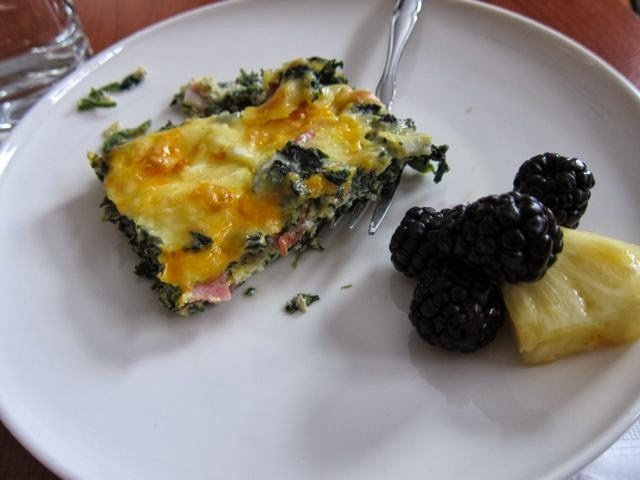 Put the bacon, nettles and cheese in a baking dish. Pour the egg mixture over everything. Bake at 450 degrees for 20 minutes. P.S. Did you notice the new plates? The plates look beautiful (I noticed them right away!) Nice looking fritatta, I'm getting hungry! Glad you got so much soup - your freezer probably has alot more room now!